Hi! Celina here! I get to stay in my very own hotel room! Isn’t that neat? The Mini Doll Hotel rocks! When you open up the door here, you see my cozy bean bag. No matter what kind of day it is, I can always sit back and chillax in the warmth of my bean bag and feel relaxed and comfortable! Here is where I eat all my meals, too. Room service has the best food, from bacon and eggs to spaghetti and meatballs to chicken alfredo! Mmm-mmm! Over here is the bathroom (notice half of everything is decorated with polka dot decor. I <3 POLKA DOTS!). When company comes over(usually Molly-Anne and Jocelyn) and they need to use the bathroom they can just slide this thing over for privacy. Oh, and the bed! Polka-dot everything! So comfy and comfortable, just like my beanbag. Well I hope you enjoyed my tour of my awesome hotel room! 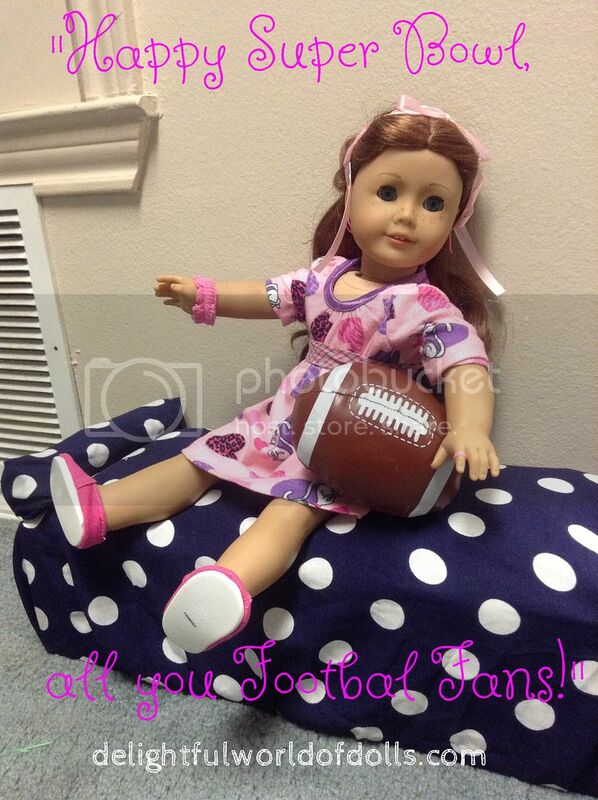 My dolls aren’t a big fan of football so last year they had a super ball instead of watching the super bowl. Awww! Celina’s hotel room is SOO cute! I love it! 😀 GIVE IT TO ME NOW! I want to get Mini Molly and Mini Kit for my 18 inch Kit and Molly. When I get Rebecca, I’ll get her Mini Rebecca! I’d rename them like you did, Madison. Aw thanks os much! Celina says thanks too 😉 LOLO! Aww! I love it! Do you recommend the mini dolls? Are they worth the price? Thanks! !